2020 isn’t that far! You may wonder what’s that cryptic statement supposed to mean? I am talking about how fast Adobe’s deadline for phasing out of Flash is approaching. Most of you may have switched your development of eLearning courses from Flash to HTML5. But what about old Flash-based courses that are still lying in your repository? Your best bet is to convert them to HTML5, ASAP! While converting a huge volume of legacy courses may seem like a daunting task at first, adopting a structured approach will certainly help reap the maximum benefits of the process. First, carry out a detailed audit of your existing courses and pick out the ones that need to be converted/ migrated to HTML5. You may want to undertake a pilot approach whereby you will begin by converting a few selected courses first and test the response from your learners. In any case, you need to start working on the conversion right away since if you plan to test, it may require some time. While you are undertaking that audit, it is also a good time to take a stock of what courses you need and what is redundant. Take your pick of the most powerful modules from the existing ones which you think are likely to have a strong impact on employees when they learn. At this point, you will also come across content which may need refreshing or some which may be completely out of date. You can even refurbish your static and non-responsive content by taking advantage of the rich features that HTML5 can offer. The next step is to assemble all the source files of the courses. These files are the ones that are used by a developer to create the eLearning modules before exporting them for the final output. A compilation of all the source files – whether created by an in-house team or by a third party vendor – needs to be in one place. This will save time and costs in the dynamic migration process and will ensure that it is smooth.These source files contain all of your media, images, text and resources. Technically, since you will have access to the original images and graphics, it may help in minimising the cost of reworking the existing content. It is good to maintain a log with the list of source files and the base tool because at times there could be multiple tools involved. This can help categorize the sources as per the original technologies they were created in. In case the source is not available, it should not hamper the conversion process since there are still workarounds available. The audit may lead you to a variety of courses in your repository – some which may do well with just a technology update, and others which may need a complete visual makeover. You will have to list out exactly which courses need what changes. For instance, there may be some courses that you have developed recently which may work well with only technology upliftment. On the other hand, legacy courses may be required to be completely restructured. Again, compliance courses may be fine with just a visual uplift. This is also a good time to ensure all your learning courses are mobile learning compliant. Your learners today use smartphones, tablets and other mobile devices which can provide them with useful learning in short bursts. They prefer small and meaningful training and do not have either the time or the patience or both to endure long sessions. If you have courses that are too long, say ranging between an hour or two, you can convert them into small, bite-sized mobile learning content. These can also serve as performance support tools (PSTs) for learners to utilise anytime, anywhere (at the point of need) even when they are not undergoing any scheduled formal training as such. Selecting the right authoring tool is a critical part of switching your content from Flash to HTML5. In today’s mobile world, responsive eLearning is a must-have so that the course works seamlessly on all types of mobile devices. You will only need a tool that supports such responsive eLearning development. It’s an established fact by now that one of the biggest advantages of moving from Flash to HTML5 is mobile learning. We would like to reiterate here that choosing a strong content authoring tool is of utmost importance because it will help in neatly compiling the existing content and outputting it to your ‘new look’ course. You may be busy working on the layout of your content, but do not forget to take a test drive. You can start by carrying out rigorous testing on a simple course for starters. It is also essential to involve a variety of end users. After all, your employees have to be comfortable with the conversion/migration because they are going to be the end users. By testing, you can also bring onboard the various echelons in your organisation as people from different parts of your organisation will get to see the importance of overhauling old content. 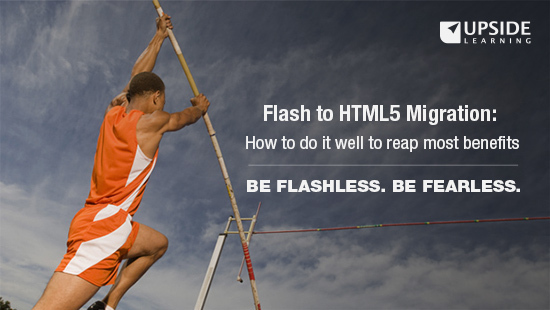 As we near the end of Flash, the switch to HTML5 is imperative. It is better to begin right away. We help our clients choose the tools best suited to their needs for this conversion and we have collated most of that knowledge in an eBook which you can access here. Moving from Flash to HTML5 is the perfect chance to revamp all your content and give everything a very smart makeover. It is a great opportunity to cater to the needs of your modern learners and give them some sterling learning opportunities.